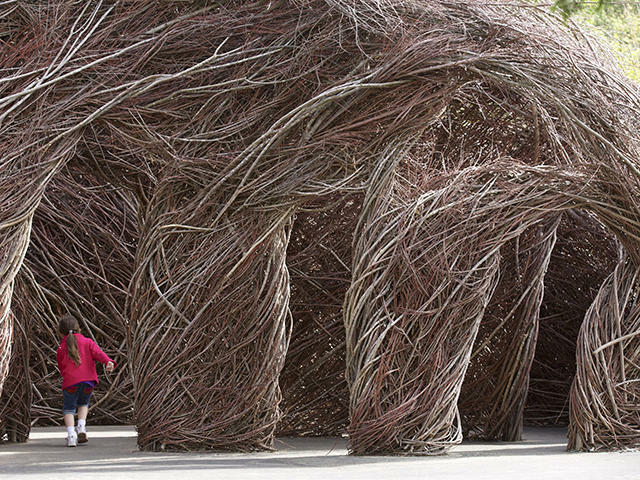 Dougherty's immersive sculptures are created by weaving flexible saplings into complex and whimsical architectural forms and remain on view until they naturally fall apart. Some installations have lasted for years. The site-specific sculpture is created over the course of three weeks with the help of staff and volunteers. Saplings used in the installation are sustainably harvested and include local chokecherry, some gathered from Chatfield Farms. Visitors may view and move through the work in a grassy clearing near the Earl J. Sinnamon Visitor Center and the Deer Creek Stables. Dougherty earned a bachelor's degree in English from the University of North Carolina and a master's in hospital and health administration from the University of Iowa. Later, he returned to the University of North Carolina to study art history and sculpture. Dougherty has created more than 250 installations, with works exhibited at the Smithsonian's Renwick Gallery, Washington, D.C.; the Mint Museum, North Carolina; the Castle of the Dukes of Brittany, France and the American Embassy in Belgrade, Serbia.